Constructing a load-bearing straw-bale extension. Source: Jakub Wihan, 2012. 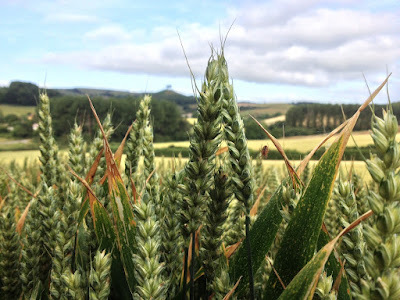 This blog was written as an assignment for the MSc Sustainability Adaptation and the Built Environment that I am studying at the the Graduate School of the Environment at the Centre for Alternative Technology, at Machynlleth in Wales. It's a brilliant course and I highly recommend it! I've been meaning to write a "what's so good about bales anyway?" blog for ages, so it was great to be able to do it with the access to resources and peer-reviewed journals that being on the course brings. I debated stripping out the in-text references for easier flow of reading, but in the end I've left them in so you can choose to ignore them or check any statements I make. These are sensible questions. This blog will summarise the evidence and show that straw-bale construction can create safe, comfortable buildings, and contribute towards climate change mitigation and limitation. The international community agree to urgently limit emissions; to prevent “dangerous anthropogenic interference with the climate system” by containing global temperatures at 2°C above pre-industrial levels (UNFCCC. COP, 2009). The UK released 474.1 million tonnes of CO2 in 2012 (UK. DECC, 2014). The construction industry can influence an estimated 47% of this, of which 83% is related to use of buildings (UK. DBIS, 2010). Creating buildings that reduce this is essential. Sustainable construction must limit emissions from energy-use whilst preparing for uncertainties of climate change, energy security, and the potential need to withstand increased extremes of weather and temperature. Barbara Jones (2009) estimates unused wheat straw in the UK could build 423,000 3-bed (350 bale) houses a year. Straw is a waste product of monoculture agriculture, the sustainability of which is arguable; but it makes sense to use currently available waste rather than extracting virgin materials. 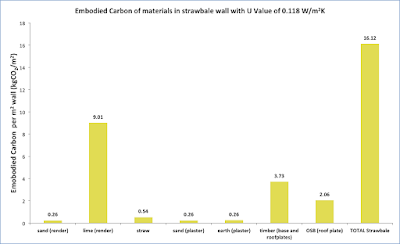 The embodied carbon of straw (amount of CO2 released by its production) is 0.01 kgCO2 per kg straw (Sodagar et al., 2011), or 1.21 kg CO2 per cubic metre. The chart below compares straw with other structural and insulation products (straw-bales act as both); kgCO2/m3 is used as it takes into account different material densities. (Click on the image for a larger version). 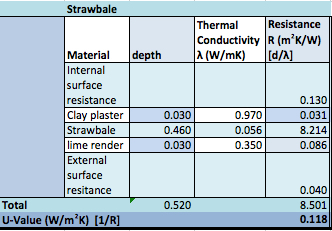 Comparing the embodied carbon of straw to that of some commonly used building materials. * kgCO2e/kg - including other gases whose greenhouse potential has been converted to CO2 equivalent. Calculated from ICE – Inventory of Carbon and Energy (Hammond and Jones, 2011). Median values used where range given in ICE. 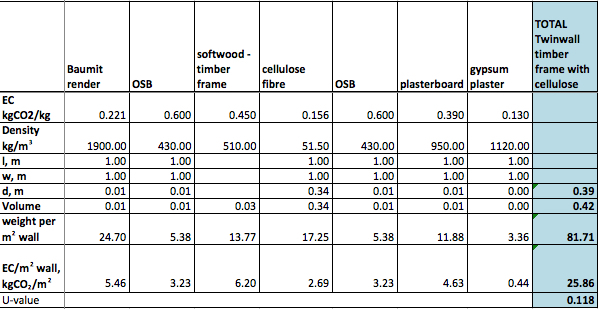 Straw-bale density derived from construction-grade bale in Jones (2009), median weight 20.5kg, size 1.05m x 0.45m x 0.36m. 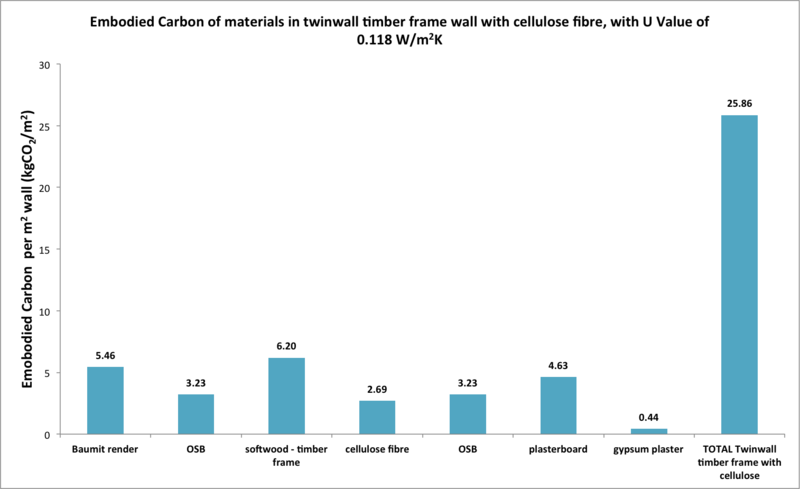 Wood wool density data from Ty Mawr Lime (2009); Glass fibre density data from RIBA Enterprises Ltd (2014). 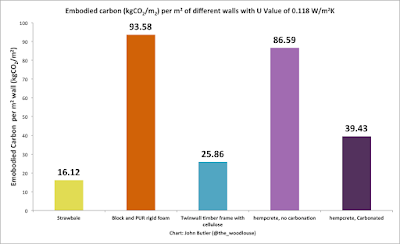 The chart shows straw-bales have significantly less embodied CO2 than alternatives (though increased recycled content in standard construction products could reduce their embodied CO2, and that of bales would increase if transported long distances). Straw is a carbon sink: it absorbs CO2 as it grows, storing it within its molecular structure. 1kg of straw contains 0.367kg of carbon; if burned or biodegraded this would re-combine with oxygen to produce 1.35kg CO2 (Sodagar et al., 2011). So 1kg of straw stores 1.35kg CO2. A standard 20.5kg construction bale would store 27.68kg of CO2. 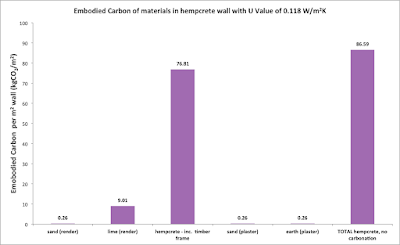 A 350 bale average 3-bed house would have around 9688kg CO2 sequestered in its walls (163.35 kgCO2/m3). 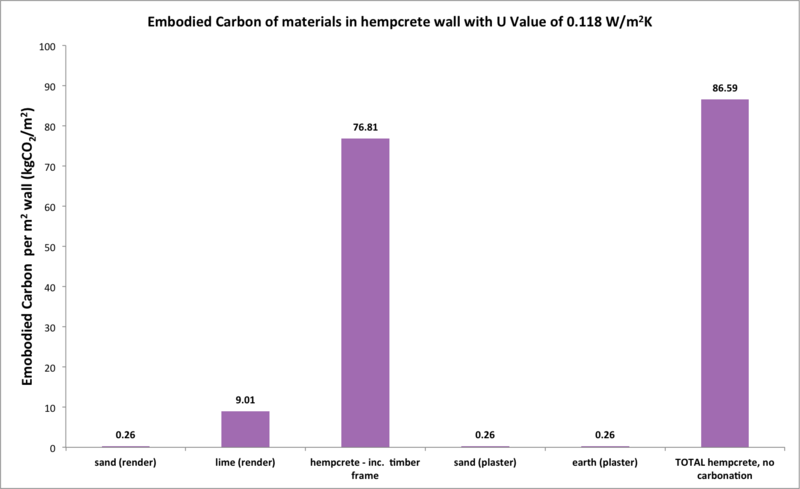 To avoid releasing sequestered carbon when dismantling buildings, materials should be reused – straw-bales removed from walls could be re-baled if required, sending little to be composted. Buildings should be designed with maximum possible lifespan. 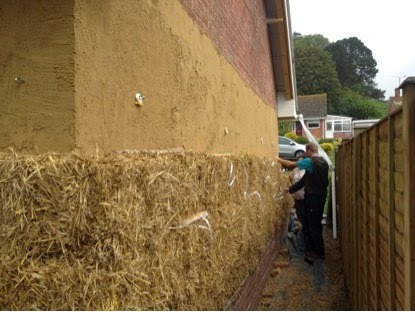 Straw-bales used as external insulation of an existing building. Temperature sensors embedded in straw-bale walls confirm that they insulate interiors from outside temperatures (Ashour, Georg and Wu, 2011.; and Straube and Schumacher, 2003). 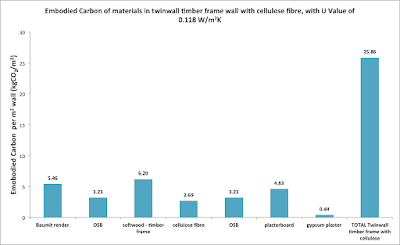 Combined with low embodied CO2 this makes straw-bales eminently suitable for use in low-energy building. UK Building Regulations require dwelling-walls to resist spread of fire for between 30 and 60 minutes, (UK. DCLG., 2013). 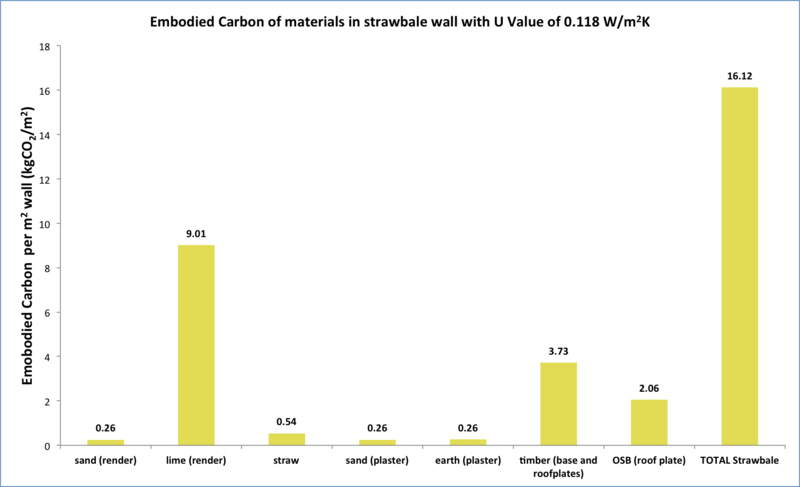 In recent tests a 3m by 2.6m plastered straw-bale wall survived 135 minutes without failing (Strawbuild, 2014). The furnace test-rig hydraulically compressed the wall to simulate real-life loadings, while subjecting one face to 1000°C. 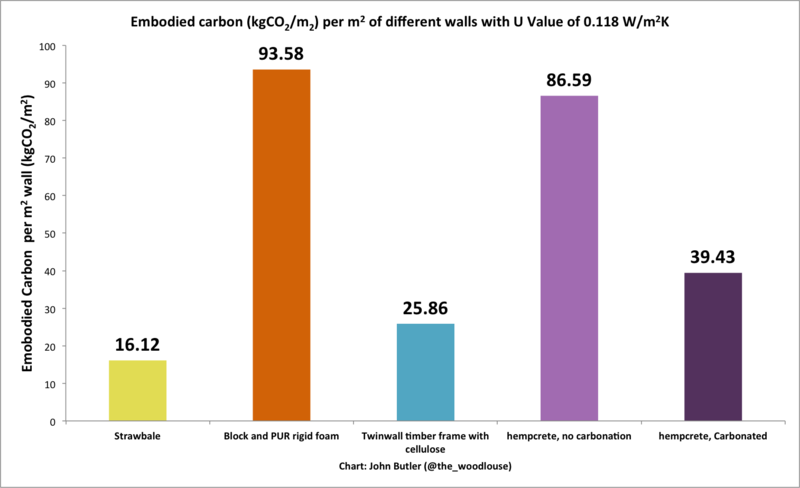 Timbers embedded in the wall’s centre reached 90°C maximum. The test ended after 135 minutes when “fireproof” boards protecting the hydraulics burned through (Strawbuild, 2014). 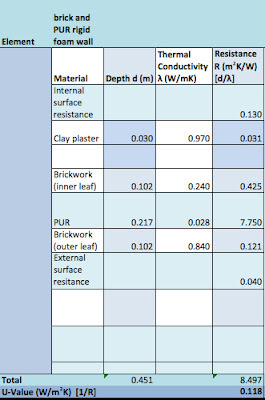 Studies of moisture in straw-bale walls agree they have low risk of decay, provided external plaster and protective detailing is well executed. (Lawrence et al, 2009.; Ashour et al, 2011.; Straube and Schumacher, 2003.; Wihan, 2007). Laurence et al (2009) monitored straw-bale moisture content of a building in Bath, UK during a period of frequent rainfall (828mm during test period). Microbial decay needs bale moisture content of 25% to 120% (Lawrence et al, 2009). 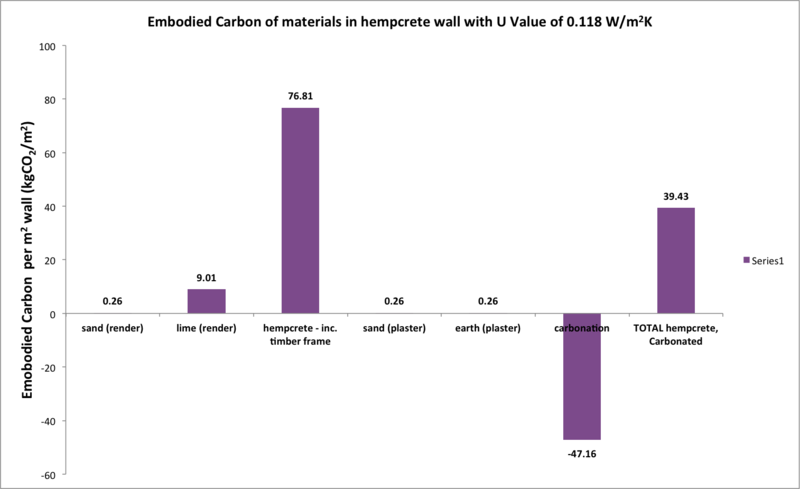 Despite the walls having little chance to dry out, moisture content ranged from 8% to 20%, well within the safe range. Monitoring of a straw-bale house in Germany found humidity variations inside and outside had little effect on moisture within the wall. Straw samples removed after 5 years showed no signs of decay, even within the bathroom wall (Wihan, 2007). The oldest known load-bearing straw-bale house was built in 1903 in Nebraska, USA. It is in good condition despite being unoccupied since 1956 (Chiras, 2000). One nearby has been continuously occupied since 1925 (Huxley, 2010). 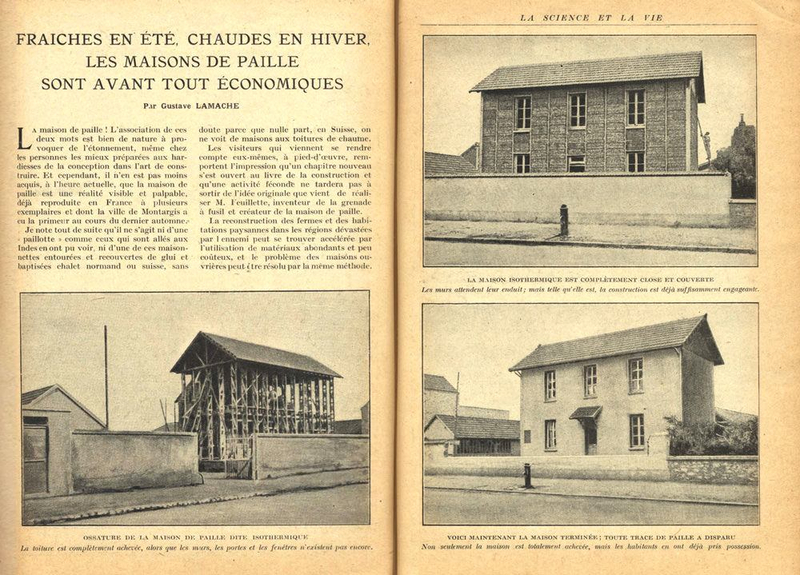 In Europe the oldest straw-bale building is a 2-storey straw-infilled timber-frame house in France, built in 1921 and still in good condition (CNCP, 2013). 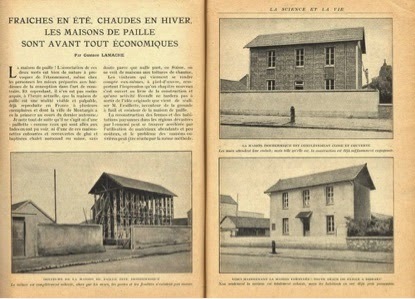 1921 newspaper article about La Maison Feuillette from ‘La Science et la Vie’ No. 56. Source: CNCP, 2014. 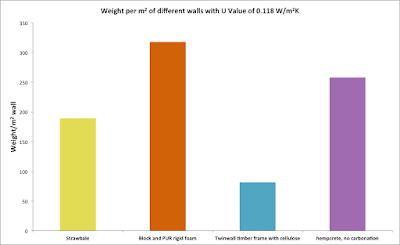 A number of studies tested load-bearing strength of straw-bale walls. 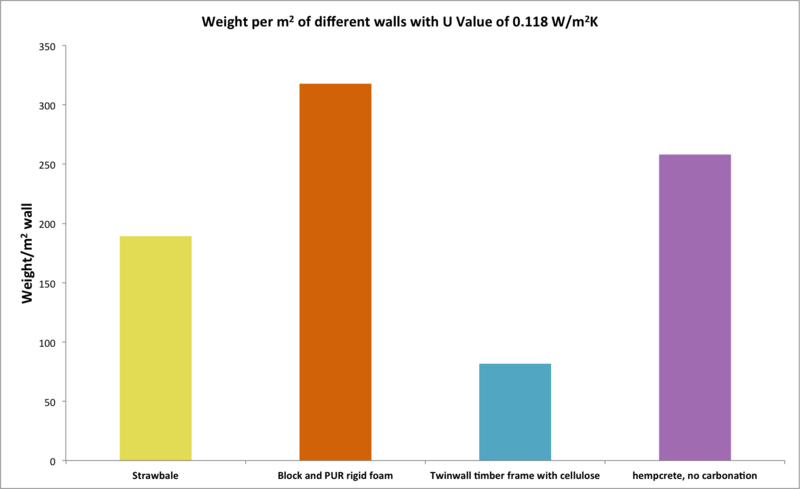 The walls safely withstood between 19.2 kN for an un-plastered bale wall (Walker, 2004) and 40kN/m for a plastered one (Faine, M. and Zhang, J., 2002), compressing as little as 55mm (Walker, 2004). 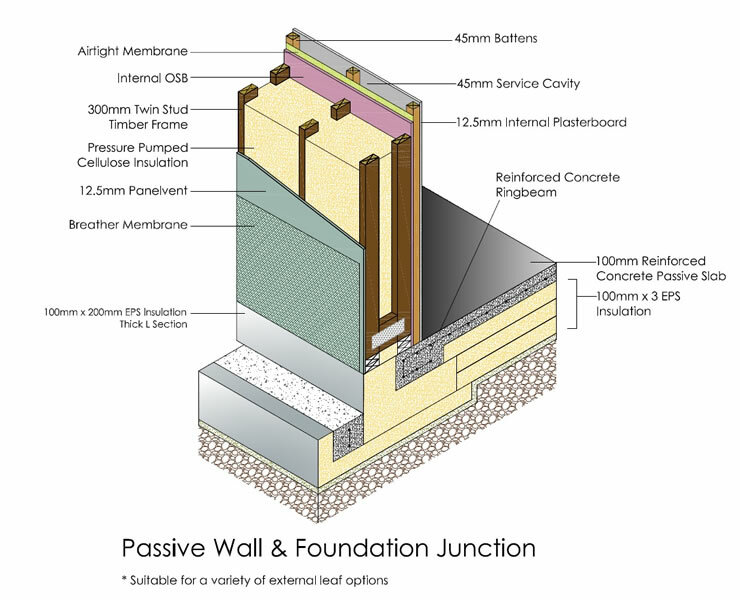 In practice compression is usually forced before plastering, to minimise future movement. 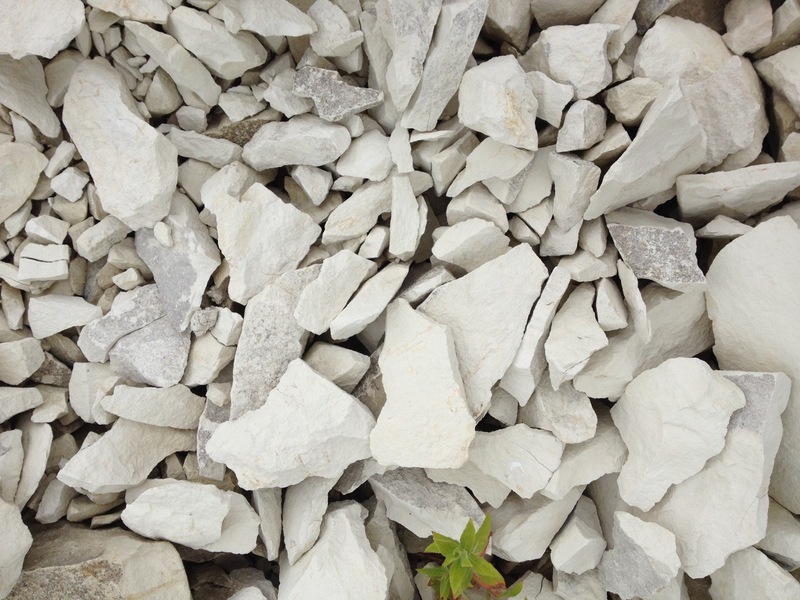 Wall failure is “unspectacular”, involving some detachment and cracking of plaster (Faine, M. and Zhang, J., 2002). Testing in Bath found prefabricated straw-bale panel walls could safely withstand hurricane force winds of 120mph (University of Bath, 2014). Currently straw is abundant. Building sustainably involves choosing materials with the best balance of positive properties and least harmful repercussions, from those available at the time. If first little pig had used plastered straw-bales, it could have saved itself and its siblings, boiled the Big Bad Wolf in a cauldron of hot water heated with no risk of burning the house down (or damaging it with steam), and lived away its days in a comfortable home handed down to its descendants – all while storing away several tonnes of CO2. 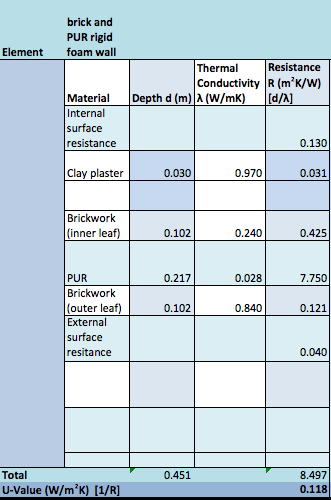 Ashour, T., Georg, H. and Wu, W. (2011) ‘Performance of straw bale wall: A case of study’, Energy and Buildings, 43(8), pp. 1960–1967. doi: 10.1016/j.enbuild.2011.04.001. Elsevier [Online]. (Accessed: 12 November 2014). Chiras, D. D. (2000) The natural house: a complete guide to healthy, energy-efficient, environmental homes. White River Junction, Vt: Chelsea Green Pub. CNCP (Centre National de la Construction Paille) (2013) La Maison Feuillette | CNCP. Available at: http://cncp-feuillette.fr/maison-feuillette/ (Accessed: 26 November 2014). CNCP (Centre National de la Construction Paille) (2014) Article ‘La Science et La Vie’. Available at: http://cncp-feuillette.fr/wp-content/uploads/2014/03/Article-la-science-et-la-vie.jpg (Accessed: 7 December 2014). Faine, M. and Zhang, J. (2002) ‘A Pilot Study examining and comparing the load bearing capacity and behaviour of an earth rendered straw bale wall to cement rendered straw bale wall.’, in International Straw Bale Building Conference, Wagga Wagga, December 2002. University of Western Sydney, Australia. 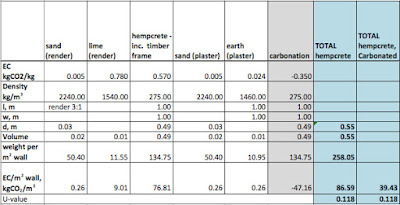 [Online] Available at: http://naturalbuildingcoalition.ca/Resources/Documents/Technical/two_storey_lb.pdf (Accessed: 21 November 2014). Hammond, G. and Jones, C. (2011) ‘Inventory of Carbon and Energy (ICE)’. Sustainable Energy Research Team (SERT) Department of Mechanical Engineering University of Bath, UK. Available at: http://www.circularecology.com/embodied-energy-and-carbon-footprint-database.html (Accessed: 28 November 2014). Huxley, E. (2010) The Bozeman Straw Bale Project - History of Straw Bale. Available at: http://www.bozemanstrawbale.com/strawbalehistory.html (Accessed: 26 November 2014). Jones, B. (2009) Building with straw bales: a practical guide for the UK and Ireland. Totnes: Green Books. 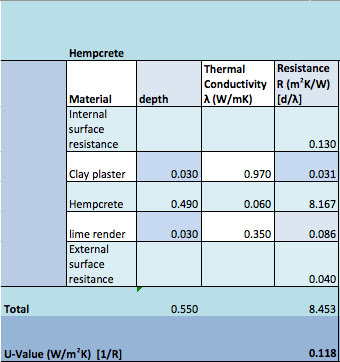 Lawrence, M., Heath, A. and Walker, P. (2009) ‘Monitoring of the Moisture Content of Straw Bale Walls’, in Howlett, R. J., Jain, L. C., and Lee, S. H. (eds) Sustainability in Energy and Buildings. Springer Berlin Heidelberg, pp. 155–164. [Online] Available at: http://link.springer.com/chapter/10.1007/978-3-642-03454-1_17 (Accessed: 19 November 2014). RIBA Enterprises Ltd (2014) 511 Paper Faced Glass Fibre Roll - Mayplas, 511 Paper Faced Glass Fibre Roll. Available at: http://www.ribaproductselector.com/Product.aspx?ci=27722&pr=Mayplas-Roof-Insulation511PaperFacedGlassFibreRoll (Accessed: 7 December 2014). Sodagar, B., Rai, D., Jones, B., Wihan, J. and Fieldson, R. (2011) ‘The carbon-reduction potential of straw-bale housing’, Building Research & Information, 39(1), pp. 51–65. doi: 10.1080/09613218.2010.528187. Taylor and Francis Online [Online]. Accessed: 3 November 2014. Straube, J. and Schumacher, C. (2003) ‘Monitoring the Hygrothermal Performance of Strawbale Walls’. 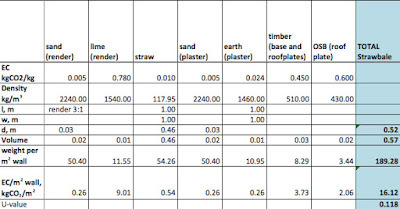 Available at: http://www.ecobuildnetwork.org/images/PDFfiles/Straw_Bale_Test_Downloads/monitoring_the_hygrothermal_performance_of_strawbale_walls_straube_schumacher_2003.pdf (Accessed: 26 November 2014). Strawbuild (2014) Strawbuild | Fire test 2014, Strawbuild. Available at: http://www.strawbuild.org/firetest_2014.html (Accessed: 12 November 2014). 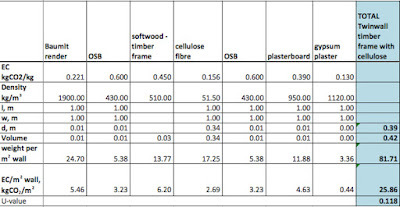 Ty Mawr Lime (2009) ‘Wood wool board - data sheet.’ Available at: http://www.lime.org.uk/downloader?publication=86 (Accessed: 12 July 2014). United Kingdom. 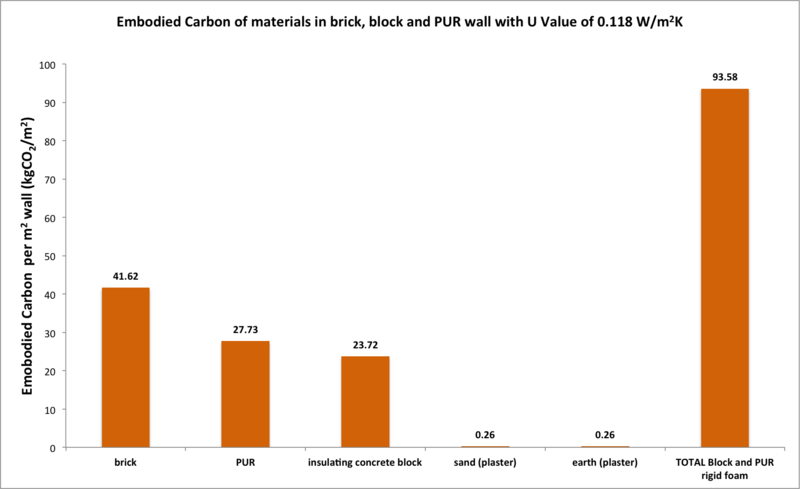 Department for Business, Innovation and Skills (DBIS) (2010) Estimating the amount of CO2 emissions that the construction industry can influence: supporting material for the low carbon construction IGT report. [Online]. Available at: https://www.gov.uk/government/publications/low-carbon-construction-igt-report-co2-emissions-influenced-by-the-construction-industry (Accessed: 27 November 2014). UNFCCC. Conference of the Parties (COP) (2009) ‘Report of the Conference of the Parties on its fifteenth session, held in Copenhagen from 7 to 19 December 2009 - Addendum - Part Two: Action taken by the Conference of the Parties at its fifteenth session.’ [Online] Available at: http://unfccc.int/resource/docs/2009/cop15/eng/11a01.pdf (Accessed: 28 November 2014). United Kingdom. Department for Communities and Local Government (DCLG). (2013) The Building Regulations 2010: Fire safety. Approved document B: Volume 1 - Dwellinghouses. 2006 edition, incorportating 2010 and 2013 amendments. [Online] Available at: http://www.planningportal.gov.uk/buildingregulations/approveddocuments/partb/bcapproveddocumentsb/bcapproveddocbvol1 (Accessed: 20 November 2014). United Kingdom (UK). Department for Energy and Climate Change (DECC) (2014) 2012 UK Greenhouse Gas Emissions, Final Figures, Revised March 2014. [Online] Available at: https://www.gov.uk/government/statistics/final-uk-emissions-estimates (Accessed: 27 November 2014). University of Bath (2014) BaleHaus: innovation in straw bale building | Research | University of Bath. 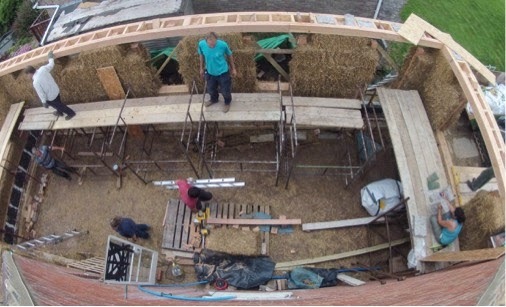 Available at: http://www.bath.ac.uk/research/case-studies/balehaus-innovative-straw-bale-building (Accessed: 19 November 2014). University of Nevada (2010) Seismic Performance of Innovative Straw Bale Wall Systems. Available at: https://nees.unr.edu/projects/straw-house (Accessed: 18 November 2014). 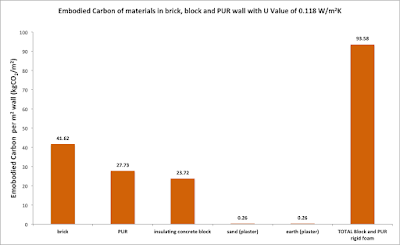 Walker, P. (2004) Compression load testing straw bale walls, test report. Test report. Bath: University of Bath. 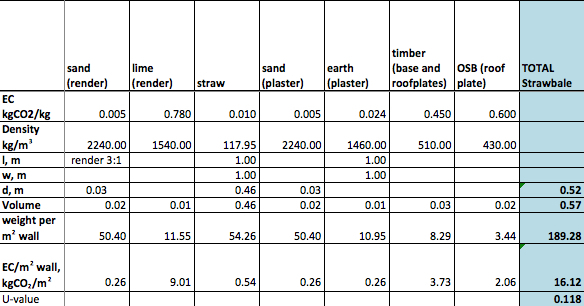 [Online] Available at: http://people.bath.ac.uk/abspw/straw bale test report.pdf (Accessed: 19 November 2014). Wihan, J. 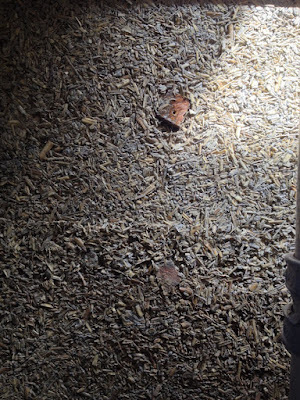 (2007) Humidity in straw bale walls and its effect on the decomposition of straw. MSc. University of East London. 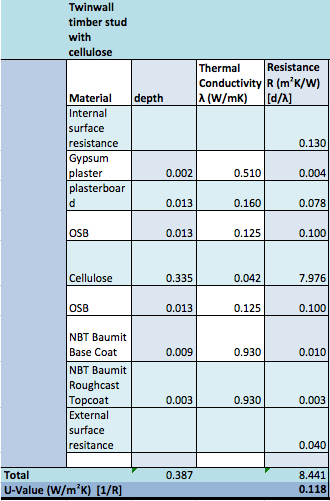 Wimmer, R., Hohensinner, H. and Janisch, L. (2000) ‘Heat Insulation Performance of Straw Bales and Straw Bale Walls’. GrAT (Center for Appropriate Technology) Vienna University of Technology. 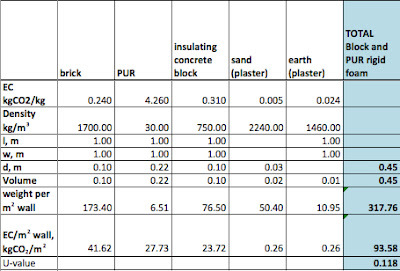 [Online] Available at: http://naturalbuildingcoalition.ca/Resources/Documents/Technical/heat_insulation_performance_strawbales.pdf (Accessed: 21 November 2014).